The Owner-Builder Program, also known as the Mutual Self-Help Housing Program, is an affordable housing program that uses “sweat equity” to reduce the overall cost of building your home. The goal of the program is to provide families with modest single-family homes with affordable monthly house payments. Through the present time, over 400 families have built their own homes in our Owner-Builder Program. Everything starts with an informational meeting with one of our Housing Advisors. We’ll assess your financial and household situation to see if you meet qualifications. If you need to improve your financial situation first, we’ll have you enter our pre-purchase homebuyer preparation program. When you’re ready, we’ll help you submit a loan application to the USDA. It takes approximately 2-6 weeks to receive eligibility. Attend pre-construction classes and safety training with your group. Choose your lot and house plan, and begin making selections for the interior and exterior of your home. Some of the selections will be made upfront, while others are made later in the construction process. You’ll close on your loan, and then it’s time to start construction! Over 9-10 months, you will work for 35+ hours per week building the homes in your group of Owner-Builders. When your group has finished building, Neighborhood Housing Solutions organizes an Open House event to celebrate your achievement. Friends, family, and community are invited to see your beautiful, owner-built homes. After that, you’re free to move in! Here are some common questions about the Owner-Builder program. The best way to learn about the program is to call and schedule a 1-on-1 appointment with one of our Housing Advisors, who will go through everything about the program and analyze your potential to qualify and meet eligibility. Sweat equity is the work that you put into building your home instead of paying someone else to do it. This reduces the cost of your home substantially. It costs you time and effort – a “work down payment” – instead of a cash down payment in order to purchase your house. Do I need prior construction experience? Not at all! Each group goes through pre-construction classes and then builds under the direction of a professional construction supervisor. From the time you formally apply to the program, it can take approximately 2-6 weeks to receive eligibility from the USDA. 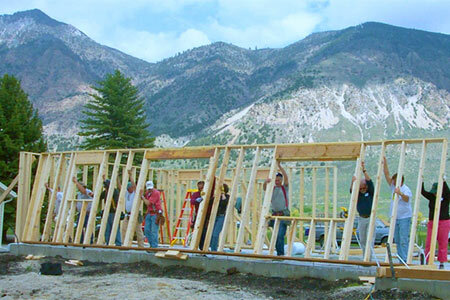 The length of the construction process depends on what time of the year your group starts, the weather, how many homes there are, and several other factors. Most groups average about 9-10 months. Is there a set construction schedule? Yes – the schedule is Tuesday, Wednesday, and Thursday from 4:00 pm to 9:30 pm and Saturdays from 7:00 am to 7:00 pm. Someone from your household or representing you must be present during these scheduled group shifts. You or others in your group may put in extra hours outside of these times, at the approval of your supervisor. Do I have to make house payments while I build? No! You do not have to pay your mortgage until your home is completed and you have moved in. Where are you building right now? We are currently accepting applications for subdivisions in Smithfield and Hyrum. See our Owner-Builder Locations Map below to see where families are currently building, as well as see where past Owner-Builder subdivisions are located. Do I build my home alone? 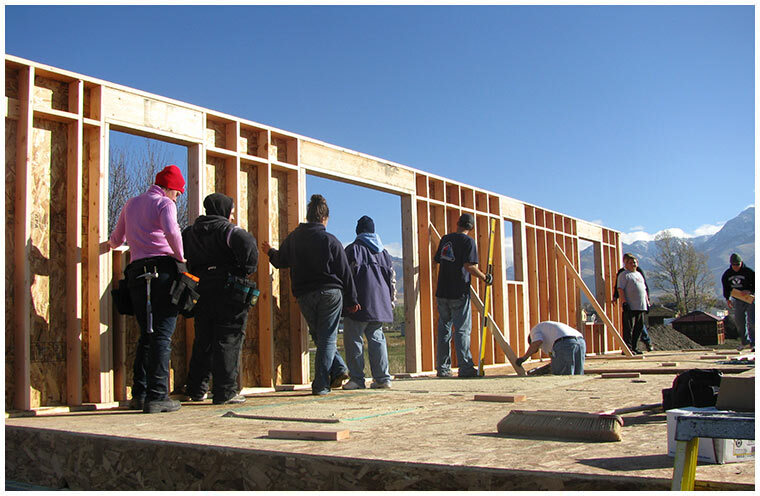 No – we will gather a group of about 5-8 eligible households who work together to build each other’s homes. You will start and finish together, and no one moves in until everyone’s homes are completed. Am I expected to build the entire home? There are certain things that are subcontracted out (plumbing, electricity, etc. ), but you will directly participate in 65% of the construction of your home. How much do I have to work each week? Each household is required to contribute at least 35 hours/week on the construction site. These hours can be put in by anyone in your household or someone representing you, at least 16 years of age or older. Do I get to choose my lot and house plan? Yes. We have over 25 house plans to choose from and multiple lots within each subdivision. You cannot have the same house plan as someone next door or directly across the street. Builders get to choose their lot and house plan in the order that they become ready to apply for the program. You can visit our House Plan Gallery to see all floor plans. How does the home loan work? By participating in this sweat equity program you qualify for a 502 Direct Self-Help loan from USDA Rural Development. For more information about how this loan works, we invite you to schedule an appointment with one of our Housing Advisors. Can I sell my home in the future? Absolutely! Like any home loan, you will have to pay back whatever you still owe on your mortgage balance. If you have been receiving payment subsidy, you may have to pay some of it back from the profit you earn on the sale of your home. The map below shows all the neighborhoods that have been built through the Owner-Builder Program. We are currently building in the Suncrest Estates subdivision in Smithfield, and the Mountain View subdivision in Hyrum (as of late 2018). If you have more questions or want to contact us for an appointment, call us at (435) 753-1112, Monday through Friday from 8:00 am to 4:30 pm.